I'm so excited to have just finished my first piece of the year. This project was really enjoyable, from finding the right inspirational location, to changing the colors and composition. 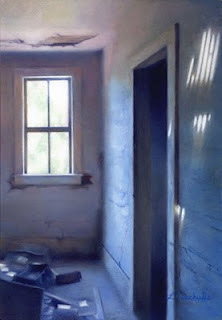 Some of my favorite areas to paint were the little papers on the floor, the lines and cracks in the wall, and the bright sections of sunlight. I love this painting Leah. Its so pretty. I hope to be able to see it in person. Incredibly beautiful, Leah. The warm/cool color shift carries a lot of emotional power. Hi Leah, that's a very beautiful painting. Thanks for sharing. Thank you very much! I truly appreciate your comments. This comment might be a duplicate, because there was a glitch in the publication of the original, but I'll try again. Leah, your painting is so beautifully executed - that goes without saying. However, what captivates my attention and keeps me from turning away from this blog page is the wonderful mood which you have created. I love your work. Thank you, I've been trying to focus on capturing the feeling of different places. I'm very glad that the mood came across in this piece. Just beautiful Leah. I've been there many times, a place like that, and you've captured that austere feeling of an old home/homestead with amazing sensitivity. Thank you very much Marc. I really appreciate your comment. Sometimes when I look at artwork I get that feeling of familiarity too, it's something that I strive for in my own work.